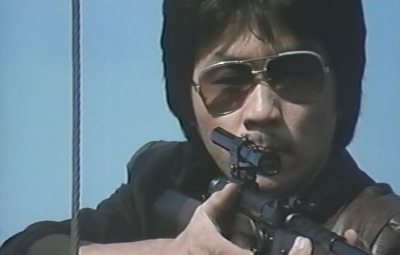 For once sourcing a Hong Kong movie to re-structure into a ninja action one for the international market, Tomas Tang combined their own Jonathan Isgar and Glen Carson footage with Lee Chiu's Struggle For Leader (1983) starring Ga Lun and Kent Cheng. While Filmark does put in effort, it's mostly towards the backend and Ninja Phantom Heroes USA really reeks more of another, uninspired day at their offices and sets. Not even Lee Chiu's movie is helping out in any significant way and the muddled plot of Ford (Glen Carson) being let go from prison to track down former war buddy Morris (Jonathan Isgar) and to crack an arms smuggling ring in Hong Kong rarely lights up the screen in any energetic fashion. Lee Chiu's gangster movie frame is dull, talky and the often available grit from working with lower budgets and standing locations is nowhere to be found. Ga Lun's Allan as a character torn between loyalties as gangster bosses compete for the arms smuggling contract with Middle Eastern buyers is also hard to connect to. Possibly made even more unclear after Filmark's dubbing and re-editing, the violent spiral he initiates and gets drawn into doesn't even lead to any punch in the department of bloody violence. It's not fully fair to dismiss Struggle For Leader as it's not fully represented here but something tells me it's obscure for a reason. 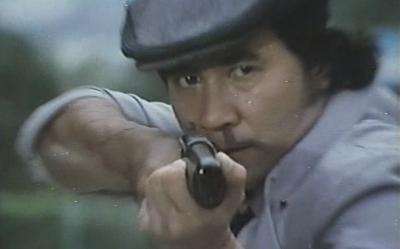 With Johnny Wang's appearance as a hitman, we do get one suspenseful sequence involving him being ambushed by bike riders but power within even this scenario is hard to come by. Matters are pretty limp, gray and sluggish and this even applies to Filmark's footage. Now, that ninjas have a place at all in a story like this is amusing and the Ford/Morris transformations into ones is a goofy sight that always amuses for the moment. Action-wise there's few instances where the able Chinese stuntmen take over however. Hence the verdict overall for Tang's 10-15 minutes of footage being what it is. Where they should receive a lot of credit once again is the focus on a lengthy action finale. Unlike IFD who didn't even spend 5 minutes on their calculated, final confrontations, Tomas Tang created very low budget, even inept but admirably, elaborate action finales for movies like this, Shadow Killers, Tiger Force etc. Morris and Ford go at each other hand to hand like expected but there's also rocket launchers employed, umbrellas firing off deadly projectiles (in reality fireworks), a flying guillotine, deadly ninja plates etc. 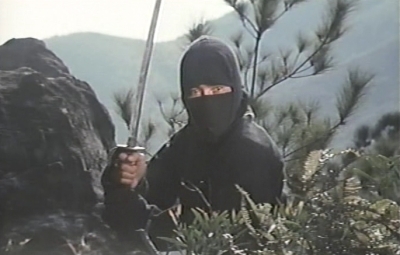 Ninja Phantom Heros USA doesn't get full redemption as 90% is deadly dull but 5-6 quotable elements during 10 minutes doesn't make it a total waste.